“Absolutely the greatest of the great! Â©2015 The Coca-Cola Company. All Rights Reserved. Fine print: Present this offer to receive one complimentary appetizer with the purchase of an adult entree. One coupon valid per table. Cannot be combined with other offers. Dine-In only. Offer expires 2/28/17. Use coupon code 55. ENCORE ATLANTA is published monthly by American Media Products Inc.
8920 Eves Road, #769479, Roswell, GA 30076 Phone 678.837.4004 Fax 678.837.4066 Copyright 2016 AMP Inc. All rights reserved. Reproduction in whole or in part is strictly prohibited. Encore Atlanta is a registered publication of AMP Inc. The publisher shall not be liable for failure to publish an ad, for typographical errors or errors in publication. Publisher reserves the right to refuse any advertising for any reason and to alter advertising copy or graphics deemed unacceptable for publication. Use the free Encore Atlanta+ app to buy Fox Theatre tickets and see content that comes alive. Download or update the app and start scanning now. 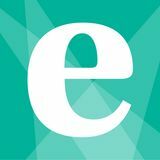 Hold your device over any page that has the E+ logo. Open a world of interactive media. P.S. : Don’t forget to scan the cover! Discover special discounts, awesome videos, and much more! 31	Advertise with Encore Atlanta! 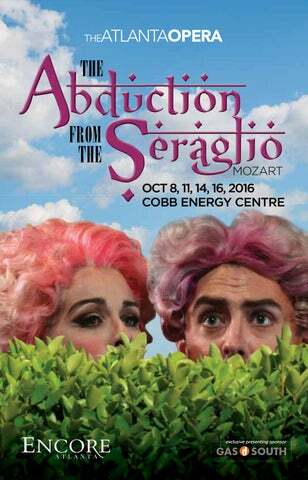 Welcome to The Atlanta Opera’s new production of The Abduction from the Seraglio! We open our 37th season with Mozart’s romantic adventure set in the exotic, mysterious Far East. In this production, we’re excited to introduce international stars who are making their debut in Atlanta. Tenor Ben Bliss and soprano Sarah Coburn have graced the world’s most prestigious stages, including The Met, Seattle, Vienna and Los Angeles. We are thrilled to bring them to Atlanta for the first time. We welcome back the brilliant comedic bass Kevin Burdette, fresh from his triumphant portrayal of the Pirate King last spring. Atlanta’s own Tom Key will be making his operatic debut as Pasha Selim and our Music Director Arthur Fagen returns to the pit to lead an opera he will conduct at the Berlin Staatsoper later this fall. We invite you to continue the adventure this season with four main stage operas for the first time since 2009. This fall, in addition to this delightful offering of The Abduction from the Seraglio, we will present the Pulitzer Prize-winning hit opera Silent Night. This production will warm your heart in its retelling of the famous Christmas truce on the front lines of World War I. Atlanta's first-ever production of Donizetti’s Don Pasquale will be transposed to Hollywood’s most glamorous period — the silent movie era. We close our season with Puccini’s grand opera Turandot, which was the first opera ever seen here at the magnificent Cobb Energy Performing Arts Centre. Our Discoveries series is back and already sold out! Maria de Buenos Aires will be performed in February at Le Maison Rouge, located on the Atlanta BeltLine. Mozart’s The Secret Gardener, a co-production with On-Site Opera, will open in a garden on New York’s Upper West Side, then debut here at the Atlanta Botanical Garden in May. These site-specific operas are truly reshaping opera for a 21st century audience. Don’t lose hope if you missed out on tickets: We’re planning to add Maria de Buenos Aires shows very soon. The Atlanta Opera is growing onstage and in the community like never before. Thank you for joining us on this adventure. AcT i Belmonte, a young Spanish nobleman, is searching for his beloved Konstanze. She, her maid, Blonde and Belmonte's servant, Pedrillo, have been captured by pirates. As the opera opens, Belmonte is on the seaside plaza outside the palace of Pasha Selim, where he thinks Konstanze is being held captive. He meets Osmin, the Pasha's overseer, who confirms that Belmonte has come to the right place, but also makes it plain that he is not welcome. Osmin is in love with Blonde, but she is in love with Pedrillo who is now serving as the Pasha's head gardener. After Osmin leaves, Pedrillo finds Belmonte, and the two scheme to rescue the two young women. cold and refuses to marry him. She still loves Belmonte and sings of her feelings for him. After she leaves to return to the seraglio (the part of an Asian palace where the women of the house live), Pedrillo introduces Belmonte to the Pasha as a visiting architect. Osmin tries to prevent the two men from entering the palace, but they brush him aside. SynoPSiS convince Osmin to join him in drinking wine. He's so successful that Osmin staggers off to go to sleep. Belmonte and Konstanze are reunited and later joined by Blonde and Pedrillo. Both men express doubts about the faithfulness of the two women, but are soon convinced that they are mistaken. The young women forgive them for their doubts, and the rescue is scheduled for that night. AcT iii At midnight, Belmonte and Pedrillo arrive outside the seraglio's walls with ladders. Belmonte succeeds in rescuing Konstanze, but Pedrillo's singing wakes Osmin, and he intercepts them before Pedrillo and Blonde can escape. Belmonte and Konstanze are brought back by palace guards, and Osmin is overjoyed to think that, at last, they are in his power. When the Pasha arrives to question the prisoners, he discovers that Belmonte's father is his old enemy. As he thinks about what to do with them, Belmonte and Konstanze declare their eternal love for each other, even in the face of torture and possible death. The Pasha returns. He has decided to be merciful, even after finding out that Belmonte is the son of his enemy. Both young couples are allowed to return to Spain. Osmin is outraged and rushes off the stage. The others express their gratitude to the Pasha. The opera ends as they leave for Spain and the chorus sings of the Pasha's great generosity. For nearly 500 years, the Ottoman Empire had expanded its range, conquering and plundering whole civilizations. Twice, Turkish forces attempted (and failed) to take Vienna — the second siege lasted two months and ended in September 1683. Mozart’s father would have known people who lived through it. Even as European slavers were shipping Africans to the Americas, North African pirates were selling Europeans to the Turks. Mozart knew of charities that paid ransoms to bring people home. Please don’t skip this page for the cast bios — at least not until you know all that Gas South does for the local arts community. We’re the presenting sponsor of The Atlanta Opera’s performance of The Abduction From The Seraglio and we offer exclusive customer discounts to the opera, ballet and much more. We call it Hometown Value — providing you great everyday low rates, top-notch local customer service and support for our community. Enjoy the show! and the jingling of cymbals, triangles, and piccolos conjured the military bands that had terrorized their city in 1683. In Abduction, they spin a musical costume around Turkish characters. and presented it to the boy seated at the harpsichord. Barrington wrote: “The score was no sooner put upon his desk, than he began to play the symphony in a most masterly manner, as well as in the time and style which corresponded with the intention of the composer.” Barrington’s account reveals something elemental about Mozart: He could instantly comprehend and master new musical styles. From his travels, he absorbed everything from Italian opera to the sacred music of J.S. Bach. As we see in The Abduction From the Seraglio and the operas to come, he throws that experience into his scores, giving opposing characters opposing musical styles. Although Mozart remained deeply devoted to his father, he defied him twice in the year or so surrounding this opera’s composition. In 1773, Leopold had procured for Wolfgang a position in the court of his own employer, the Archbishop of Salzburg. While Leopold knew his place in the world, Wolfgang resented it. As a low-ranking servant, Mozart suffered many humiliations at the hands of his boss. By spring 1781, he begged for release. He succeeded in June, getting himself booted out of Salzburg — literally “with a kick in the arse.” He left for Vienna, seeking fame and fortune. While composing Abduction, Mozart ponders the conundrum of writing beautiful music about anger. “Passions, whether violent or not, must never be expressed to the point of exciting disgust, and as music, even in the most terrible situation, must never offend the ear, but must please the listener.” Mozart’s solution is to give the singer more notes. When his noble heroine Konstanze is confronted by a fate worse than death, she lets it fly, singing a flurry of runs, trills, and leaps. Her feisty servant, Blonde, defies Osmin in similar virtuosic fashion, singing, “I am an Englishwoman, born for freedom.” (It’s interesting that Mozart’s egalitarian-minded servant is English, a safe distance from Austria, given that he was composing at the command of the Austrian Emperor). The Abduction From the Seraglio, which opened July 16, 1782, was a hit. Profits poured into the Burgtheater, from which Mozart received a modest flat fee. Less than a month later Mozart defied his father once more and married Constanza Weber. That he courted Constanza while creating the operatic heroine Konstanze was purely coincidence; that he delighted in the irony was pure Mozart. American tenor Ben Bliss is a 2016 recipient of the Martin E. Segal award at Lincoln Center, awarded by the Metropolitan Opera. He was also the recipient of the Mozart and Plácido Domingo awards at the 2015 Francisco Viñas International Competition in Barcelona, receiving 2nd place overall, first prize in the 2014 Gerda Lissner and Licia Albanese-Puccini Foundation competitions, as well as a Sara Tucker and Sullivan Foundation grant. Mr. Bliss is also the 2013 Operalia Don Plácido Domingo Sr. Zarzuela prize-winner. Ben Bliss’ 2016-17 season includes a U.S. recital tour with pianist Lachlan Glen, with stops at Carnegie Hall, the Folly Theater in Kansas City as part of the HarrimanJewell series, Theater of the Arts at the University of the District of Columbia as part of the Vocal Arts DC Emerging Artists series, Hahn Hall at Music Academy of the West as part of the University of California, Santa Barbara Arts & Lectures series, and in Cincinnati with Matinée Musicale. Operatic appearances for Mr. Bliss include a return to the Metropolitan Opera, first as Tamino in The Magic Flute and then as Steuermann in Der Fliegende Holländer, conducted by Yannick Nézet-Séguin. Other opera appearances include Tom Rakewell in The Rake’s Progress for a role and house debut with Boston Lyric Opera and Camille, Count de Rosillon, in Die lustige Witwe in concert for his house and role debut with the Gran Teatre del Liceu in Barcelona. CHANCES ARE, IT’S SOMEONE YOU KNOW. Imagine living a life filled with excruciating pain, mental anguish, surgeries, and constant disruptions. Now imagine not knowing when those things will happen. That’s Crohn’s disease and ulcerative colitis. For 1.6 million Americans, including thousands of children, that life is a cruel reality. They need you to stand up for them. You can work with the Crohn’s & Colitis Foundation of America to help find cures and give support. What are you waiting for? HELP SOMEONE YOU KNOW. ATLANTA OPERA DEBUT: ThE PirATES of PEnzAncE, 2016 Praised by The New York Times for “singing with earthy power and flair,” the highly sought-after bass Kevin Burdette has garnered critical acclaim as “an excellent comic actor” for his “deadpan timing” and “vibrant personality” in comedic roles (Opera Today). His 2016-17 season engagements include Sulpice in La fille du régiment with Washington National Opera; reprising Beck Weathers in Everest with Dallas Opera; Nick Shadow in The Rake’s Progress with Boston Lyric Opera; General Polkan in The Golden Cockerel and Frosch in Die Fledermaus with Santa Fe Opera; The Pirate King in The Pirates of Penzance with Lyric Opera of Kansas City; and Messiah at Duke University. In the summer of 2016, Mr. Burdette sang Ko-Ko in The Mikado with Chautauqua Opera. Recent highlights include the Pirate King for his Atlanta Opera debut; Stefano in Adès’ The Tempest (Diapason d’Or and Grammy awarded) with Metropolitan Opera; Sulpice with Santa Fe Opera; Dulcamara in L’elisir d’amore and Bartolo in Il barbiere di Siviglia with Opera Philadelphia; Judge Turpin in Sweeney Todd with Portland Opera; Mustafà in L'italiana in Algeri with Seattle Opera; Leporello in Don Giovanni with Boston Lyric Opera; Osmin in Die Entführung aus dem Serail with Argentina’s Teatro Colón; T.J. Rigg in Elmer Gantry with Florentine Opera; creating the role of Stobrod/Blind Man in Higdon’s Cold Mountain with Santa Fe Opera; and creating Eric Gold/Ghost of Vittorio Bazzetti in Heggie’s Great Scott, and OB in Mark Adamo’s Becoming Santa Claus with Dallas Opera. Lauded by The Baltimore Sun for his “impassioned phrasing” and a “ping in [the] voice that pays dividends,” tenor Matthew Grills is a member of the ensemble at the Bayerische Staatsoper. His numerous roles at the house include Pedrillo in Die Entführung aus dem Serail, Brighella in Ariadne auf Naxos, Edgar Evans in the world premiere of Srnka’s South Pole. He also makes his role and company debut this season as Idreno in Semiramide with the Opéra national de Lorraine and sings the Berio orchestration of Verdi’s 8 Romanze with the Orchestre de la Haute Ecole de musique de Genève. He has joined San Francisco Opera as Tobias Ragg in Sweeney Todd as well as for Almaviva in family performances of Il barbiere di Siviglia, Portland Opera for Nemorino in L’elisir d’amore, and Wolf Trap Opera as Fenton in Falstaff. Before joining the ensemble at the Bayerische Staatsoper, he was a member of the company’s prestigious Opernstudio and sang the title role of Le comte Ory and Fabrizio in Martinů’s Mirandolina. Mr. Grills was presented by the Vocal Arts D.C. and the Washington Performing Arts Society in solo recital at the Terrace Theater at the Kennedy Center and sang his first performances of Handel’s Messiah with the Hartford Symphony. He was a 2012 grand prize-winner of the Metropolitan Opera National Council Auditions and a member of the young artist programs of the Santa Fe Opera and Portland Opera. Katrina Galka has performed with Opera Theatre of Saint Louis, appearing as Papagena in Isaac Mizrahi’s The Magic Flute, and with Portland Opera as Adina in L’elisir d’amore, Johanna in Sweeney Todd, Elvira in L'italiana in Algeri, Frasquita in Carmen, and Papagena in The Magic Flute. She performed last fall with Odyssey Opera and Boston Modern Orchestra Project singing The Cat in Gunther Schuller's The Fisherman and His Wife. As a member of Arizona Opera's Studio Artist program, Katrina will sing First Sprite in Rusalka and Clorinda in La Cenerentola. In concert, Ms. Galka has appeared at the Morton H. Meyerson Symphony Center in Dallas, singing the role of Cunegonde in an evening of excerpts from Bernstein's Candide. Ms. Galka has been a prize-winner in a number of regional, national, and international competitions, including the Metropolitan Opera National Council Auditions, Mario Lanza Scholarship, Jensen Foundation Vocal Competition, Marcello Giordani International Vocal Competition, Heida Hermanns International Voice Competition, Dallas Opera Guild Competition, and National Opera Association’s Vocal Competition. She is also a National Foundation for the Advancement of the Arts Young Arts winner and a U.S. Presidential Scholar in the Arts, for which she has appeared as a soloist at the John F. Kennedy Center. GREAT FOR EVENTS, WEDDINGS, GALAS, MEETINGS & TRADESHOWS! Printed on-site for you or shared on social media! HOW IT WORKS Our team of photographers will set up a photo booth or green screen at your next event. A customized border with your brand or event name is applied to the photos. Within seconds, attendees are presented with a full color, branded photo. Arthur Fagen is a regular guest of the world’s leading opera houses, concert halls, and music festivals, including most notably, the Metropolitan Opera, Lyric Opera of Chicago, Staatsoper Berlin, Bavarian State Opera, Deutsche Opera Berlin, and Vienna Staatsoper. In North America, he has been a frequent guest of the New York City Opera, Portland Opera, Chautauqua, and New Orleans Opera, among others. Notable orchestras he has conducted include the Baltimore Symphony Orchestra; the Czech Philharmonic; RAI Orchestras of Turin, Naples, Milan, Rome; and Israel Symphony Orchestra. Maestro Fagen served as music director of the Dortmund Philharmonic Orchestra and Opera, principal conductor in Kassel and Brunswick, chief conductor of the Flanders Opera in Antwerp and Ghent, and was music director of the Queens Symphony Orchestra. He has made a number of recordings for Naxos and BMG. Born in New York, maestro Fagen began his conducting studies with Laszlo Halasz and served as assistant to Christoph von Dohnanyi at Frankfurt Opera and James Levine at the Metropolitan Opera. Maestro Fagen is professor of music in instrumental conducting at Indiana University’s Jacobs School of Music. Jacob A. Climer is a costume and scenic designer for theater and opera. Originally from Dallas, he studied costume and scenic design and received a B.F.A. from University of Evansville and an M.F.A. from Carnegie Mellon University. Jacob's work has been seen at New York Theatre Workshop, ERS, Primary Stages, the Public Theater, Dallas Theatre Center, Barrington Stage Company, and numerous stages nationwide. His most recent productions include costumes for Fondly, Colette Richland (NYTW), Informed Consent (Primary Stages), ERS' The Sound and the Fury and Arguendo (Public Theater), Social Security (Bushwick Starr), and Les Miserables (Dallas Theatre Center), as well as senery and costumes for The Abduction from the Seraglio (Des Moines Metro Opera), Rinaldo (Portland Opera), and Ariadne auf Naxos (Curtis Insititute of Music). Proud member of United Scenic Artists 829. Jacob lives in Brooklyn. Selected credits – Theater: Twelfth Night (The Public), Her Requiem (LCT3), Fidelis (The Public), Ping Pong (The Public), The Convent of Pleasure (Cherry Lane) Ike at Night (UTR/The Public), Quiet, Comfort (Hoi Polloi), Take Care (The Flea), Platonov (The Kitchen/ Jay Scheib), The Hatmaker’s Wife (Playwrights Realm), Book of Disquiet (Peak Performances), Ghosts (Theatreworks), Stoop Stories (Weston Playhouse), Carnival Kids (Lesser America), The Woodsman (Oberon Ensemble), The Drawer Boy (Soho Playhouse), Baal (Hoi Polloi). Opera: Scarlet Letter (Opera Colorado), Cato in Utica (Opera Lafayette), L’ Elisir D’Amour (The Curtis Institute). Dance: Premieres with Sidra Bell, Alexander Ekman, Aszure Barton, Kate Weare, Benoit Swan-Pouffer, Cedar Lake Contemporary Ballet, Rennie Harris Pure Movement, The National Dance Company of Wales, Aalto Ballet Theatre Essen Germany, and the Royal New Zealand Ballet. DO YOU WANT TO REACH MORE THAN 4 MILLION ACTIVE, ENGAGED AND CONNECTED PEOPLE THIS YEAR? ADVERTISE IN ENCORE ATLANTA! To find out about advertising with Encore Atlanta contact Tom Casey by phone, 678–837–4032, or by email, tomcasey@encoreatlanta.com, today! S. Katy Tucker is a video and projection designer based in Brooklyn. Her work in theater and opera has been seen around the world, including the Metropolitan Opera, the Sydney Opera House, San Francisco Opera, L.A. Opera, Carnegie Hall, the New York City Ballet, the Kennedy Center, BAM, and The Park Avenue Armory. She has collaborated with composers and musicians like Paul McCartney, John Zorn, Jeffrey Ziegler, and Paola Prestini. Her artwork has been seen at The Corcoran Gallery, Artists Space in New York City, The Dillon Gallery in New York City, The Kitchen and National Sawdust. Recent productions: The Ring Cycle at the Kennedy Center; Two Women at San Francisco Opera and Teatro Regio Torino; Florencia en el Amazonas at Washington National Opera and L.A. Opera with Francesca Zambello; Dmitri Tcherniakov’s Prince Igor at the Metropolitan Opera; Ouroboros Trilogy, a fully immersive multimedia production at the Majestic with Michael Counts; Tristan and Isolde and The Flying Dutchman with the Sydney Symphony Orchestra; Hunds Hjärta at Uppsala Stadsteater and a season of multimedia collaborations with the St. Louis Symphony and conductor David Robertson. Upcoming projects: Prince Igor at the Dutch National Opera; Das Rheingold at North Carolina Opera; and Ulysses with The Metropolitan Museum of Art. PUT YOURSELF IN THE SPOTLIGHT. THE EXQUISITELY CRAFTED LEXUS ES AND ES HYBRID You’re always working toward something. Every now and again, just make sure that something is you. Experience true indulgence in the Lexus ES and ES Hybrid. With innovative technology, reﬁned styling and exceptional comfort, you won’t just know it when you see it—you’ll know it when you feel it. Mr. Huff is an associate professor and faculty director of opera choruses at Indiana University’s Jacobs School of Music. He has led choruses in IU Opera Theater’s productions of Don Giovanni, The Merry Widow, Akhnaten, the world premiere of The Tale of Lady Thi Kinti, H.M.S. Pinafore, La traviata, Dead Man Walking, The Last Savage, and South Pacific. Mr. Huff studied piano with Sarah Martin, Peter Takacs, and Lillian Freundlich. He has performed with singers throughout Europe and the United States and served as coach with the Peabody Opera Theatre and Washington National Opera. He also has performed in master classes given by renowned singers and pianists such as Sir Peter Pears, Licia Albanese, Eileen Farrell, Dalton Baldwin, Leon Fleisher, and Elly Ameling. He has been musical director of The Atlanta Opera Studio Tour, Georgia State University Opera, and Actor’s Express, and served as chorus master with The San Diego Opera. In 1984, he received Tanglewood’s C.D. Jackson Master Award for Excellence, presented by Seiji Ozawa and the Boston Symphony Orchestra. Mr. Huff was one of four Atlanta artists chosen for the first Loridans Arts Awards, given to artists who have made exceptional contributions to the cultural life of Atlanta. Find out what you need to know before the show. Read the current and past Encore Atlanta programs for the Fox Theatre, Atlanta Symphony Orchestra, Alliance Theatre and The Atlanta Opera online at issuu.com/encoreatlanta. The ATlAnTA oPerA STudio The Atlanta Opera is excited to announce the launch of its first-ever young artist program, The Atlanta Opera Studio. During the 2016-17 season, the artists will appear in featured and supporting roles in mainstage productions, studio tour performances, and a variety of programs and special events throughout the metro Atlanta community. The program provides talented emerging artists with valuable performance experience working alongside internationally acclaimed operatic professionals. The artists will participate in master classes and specialized instruction, enhancing and deepening their professional education through coaching in language, stage skills, and career development. “The Atlanta Opera is proud to launch a program that will support talented young artists at the brink of a major international career,” said Tomer Zvulun. “The program will provide the studio artists with continued education, performance opportunities, and an environment that will prepare them for a successful career in the opera world. For our audiences and patrons, this will be a unique opportunity to get acquainted with young, up-and-coming artists who will establish a meaningful, lasting connection with our community.” The six members of the 2016-17 Atlanta Opera Studio are soprano Bryn Holdsworth, tenor Santiago Ballerini, baritone Andrew Pardini, bass-baritone Alan Higgs, pianist and vocal coach Valerie Pool, and stage director Brenna Corner. *The Jerry & Dulcy Rosenberg Young Artist Stage Director, given in honor of Tomer Zvulun. Musicians employed in this production are represented by the American Federation of Musicians of the United States and Canada. Before heading to Atlanta, soprano Sarah Coburn took some time out of her busy singing schedule to chat with us about her life as a singer and learning the difficult role of Konstanze. THE ATLANTA OPERA: Did you grow up in a musical family? SARAH COBURN: Yes, my mother’s side of the family is very musical. My grandmother was a jazz singer and my aunt is a fabulous pianist. My sisters have amazing voices. Every holiday we sang and played. It was mostly barbershop quartets or country music, like the Judds or Vince Gill. Not a bit of opera, though! AO: Who or what influenced you to become a singer? SB: I didn’t plan on becoming a singer, although I always planned on majoring in music in college. I studied music education and was encouraged by my voice teachers to think about pursuing performance instead of teaching. AO: You’ve mentioned in past interviews that Konstanze is one of your favorite roles to sing. What is it about this part that interests you? behind The curTAin challenge, and one I am thrilled to accept. The role requires a great deal of stamina and virtuosity. I have sung Blondchen in the past, and I always hoped I would have the opportunity to sing Konstanze. AO: Indeed! This is considered by some to be Mozart’s most vocally challenging music for soprano. Where do the challenges lie in this role, and how do you deal with them? SB: The challenges lie in the lengthy arias, and the fact the two of them are back to back. The arias are exercises in breath control, dynamic control, and support in a difficult tessitura. I love them, though. AO: What’s your regimen for staying healthy when you’re on the road? SB: Sleep, water, exercise, and I must warm up properly every day before singing. I am not too stressed about everything being in perfect condition in order to sing well; I can’t be — I have three little kids! AO: Is this your first time in Atlanta? Do you have any plans to explore the city while you’re here? SB: I have never spent time in Atlanta. Right now, my goal is to sing the role well and take care of my kids. Exploring the city will come after opening night! years before Disney released its version, a wise tutor saves the day instead of a fairy godmother, and a bracelet replaces the lost glass slipper. The Studio Tour will will perform in schools and community centers in January and February 2017. We hope that your child will have the opportunity to experience the fantastic world of opera in their school. To learn more about our Studio Tour and other education and community engagement programs, please visit our website at www.atlantaopera.org. At Encore Atlanta, we love our fans. That’s why we frequently give away tickets, share special 50% off deals and the best Atlanta has to offer every day. So connect with Encore Atlanta on Twitter, Facebook, YouTube, Google+ and Pinterest! Don’t forget to download the free Encore Atlanta+ app for your mobile device to unlock bonus content in our show programs (and this ad). AnnuAl GivinG Silver (continued) Mr. & Mrs. William Hinson Mr. & Mrs. James Horgan Dr. & Mrs. S. G. Hornsby, Jr. Mrs. Sally Horntvedt Mr. & Mrs. Nicholas C. Howard Dr. Karen Kuehn Howell Mrs. Catherine Hughes Ms. Irmgard S. Immel Mr. Rolf Ingenleuf Mr. James Jackson Mrs. Louise Jackson Mrs. Mary O. Jensen Mr. & Mrs. Thomas E. Johnston Ms. Jo. Elliott Jones Ms. Rachel A. Jorgensen Mr. & Mrs. Jerry Juchelka Mr. Robert L. Karem, Jr. Jane & Bob Kibler Ms. Donna J. Kilgore Dr. Joon Y. Kim & Myong Suk Kim Mr. Allen D. King, Jr. Mr. Emory King Ms. Darothea H. Kirkland Mr. Chris Kitchens Mr. Al Klicius Ms. Caroline B. Klopstock Mr. Richard Kranzmann Helen & Steven Kraus Mrs. Emma Lankford Lucy R. & Gary Lee, Jr. Sophie Li Ms. Nancy S. Linzmeyer Vaneesa & Allan Little Mr. Albert C. Loebe & Ms. Cecelia A. Bonfils Donna & Trevor Lumb Mrs. Carol Lyttle Jr. Mr. & Mrs. Thomas P. Lyttle Mr. David Mackley Dr. Chalem Mahadevan Dr. David J. Martin Ms. Nancy Martin Adair & Joe Massey Mrs. Margaret McCamy Mr. M. Reynolds McClatchey Jr. Handmade pasta, perfectly cooked steaks & fresh seafood expertly prepared using the finest ingredients. Enjoy our Award Winning Meatballs! *Mr. & *Mrs. Charles R. Yates, Sr.
Mr. Allen W Yee, Esq. PRESENT YOUR TICKET STUB FOR 10% OFF YOUR MEAL! HALF-OFF WINE SUNDAYS Join us Sundays for half-priced bottles of wine. Choose from our extensive wine list and toast to a weekend well spent! Concession stands are located in the center of the lobbies on all three levels. Food and beverage items are prohibited inside the theater. Thank you for your cooperation. Restrooms are located on house right and house left of all three lobbies. Family restrooms are also located on house right of all three lobbies. Mobility-impaired patrons may use any of our restrooms. There are 1,000 parking spaces available at $6 per car. Valet service is available for $10. Please be sure to allow enough time for travel to the theater and parking as there is no late seating. There is one Bank of North Georgia ATM located in the grand lobby. Coat check is available at the concierge desk. emerGency inFormATion In the event of an emergency, please locate the nearest usher who will direct you to the appropriate exit. Elevators are located on each side of the lobbies on all levels. Lost and Found items are turned into the concierge desk on the day of a performance. To inquire about a lost item, please call the House Manager at 770-916-2828. Persons requiring access assistance are asked to contact the box office at 770-916-2850 for advance arrangements. Audio-clarification devices are available to our hearing-impaired guests at no charge. This is on a first-come, first-served basis, or you may call the House Manager ahead of time to reserve one at 770-916-2828. A limited number of booster seats are also available. All items require a form of identification to be held until the item is returned. • All patrons, regardless of age, must have a ticket in order to be admitted to the performance. Please be aware that not all performances are suitable for children. • Infants will not be admitted to adult programs. Parents will be asked to remove children who create a disturbance. • There is no late seating allowed. Closedcircuit monitors are provided in the lobby as a courtesy to latecomers. • Please turn off all cellphones prior to the beginning of each performance. • Please limit conversation during the performance. • Cameras (including use of cellphone camera) and audio and video recording devices are strictly prohibited at all times. • Leaving while the show is in progress is discourteous and we ask that you refrain from doing so. • Please unwrap all candies and cough drops before the performance. Ins I st on makI ng a t o a s t. Enjo y l I f E t o t hE f ul l E s t thEr E arE no drE ss rE h Ea r s a l s . hav E y our st E ak and E at I t, t o o . We believe joint pain shouldnâ&#x20AC;&#x2122;t slow you down. At WellStar, we believe you deserve better-quality living. The WellStar Musculoskeletal Network is an extensive team of experts who specialize in the treatment of bones, muscles and joints. WellStar surgeons use advanced technology and techniques to expertly diagnose and treat hip and knee pain. And, our team of rehabilitation and therapy specialists will be there every step of the way to get you back to health. With convenient access to some of Georgiaâ&#x20AC;&#x2122;s best joint replacement surgeons, why would you trust anyone else with your hip and knee pain? To register for a free joint pain seminar or for a physician referral, call 770-956-STAR (7827). We believe in life well-lived.